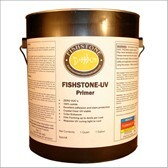 FISHSTONES 100% solid UV INSTA-CURE gloss topcoat provides incredible stain and scratch resistant for concrete sealing. 100% solids means you don't lose product due to evaporation and can be cured instantly. No need to wait for product to dry first. The 100% solid system is a color enhancing, easy to apply and use system that will provide years of excellent performance. 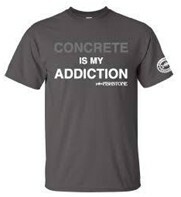 Concrete to be sealed should be completely dry(minimum of 6 days from casting), clean and free of contaminants prior to sealing. 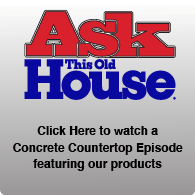 Concrete should not be polished above a 400 grit abrasive. Ideally stop at 200grit to insure good adhesion. 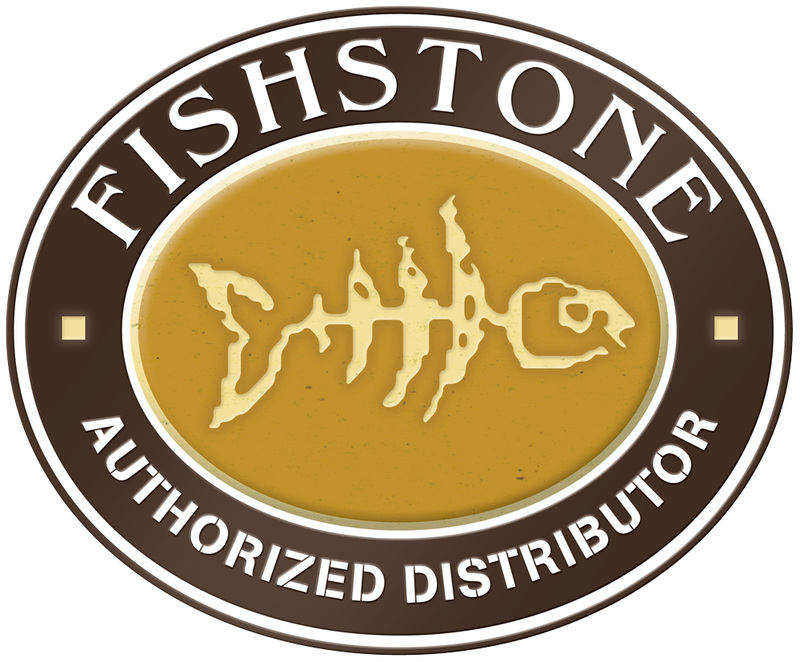 Be sure to block all stray UV rays or sunlight coming through window or openings as this may cause premature curing of the sealer. 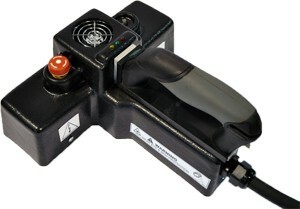 Product can be applied up to 4 mils thick and must be cured using an approved UV curing light. Spraying-If spraying using an HVLP sprayer dilute the primer with 10% acetone to reduce viscosity. It is imperative to use an OSHA recommended filter mask( a full face mask is recommended) as although not toxic this product may cause sensitivity to skin and is irritating to eyes, respiratory system. Spraying atomizes the particles making them airborne and more likely to cause discomfort and headaches. Topcoat can be applied up to 5 mils thick for the gloss version and 3 mils thick for the matte version. After applying primer you may sand if needed to remove any dust particles with a 220 grit sandpaper. Wipe surface with Solvent-wipe prior to application after any sanding. Spraying-If spraying using an HVLP sprayer dilute the primer with 10% acetone to reduce viscosity. It is imperative to use an OSHA recommended filter mask( a full face mask is recommended) as although not toxic may cause sensitization by skin contact and is irritating to eyes, respiratory system and skin. Spraying atomizes the particles making them airborne and more likely to cause discomfort and headaches. If you need to recoat the topcoat you must sand the surface first with a 220 grit sandpaper and a solvent wipe. Important note: Always test sealer before using on final project. Your application and concrete may be different than someone else and what works for one may not work for another. 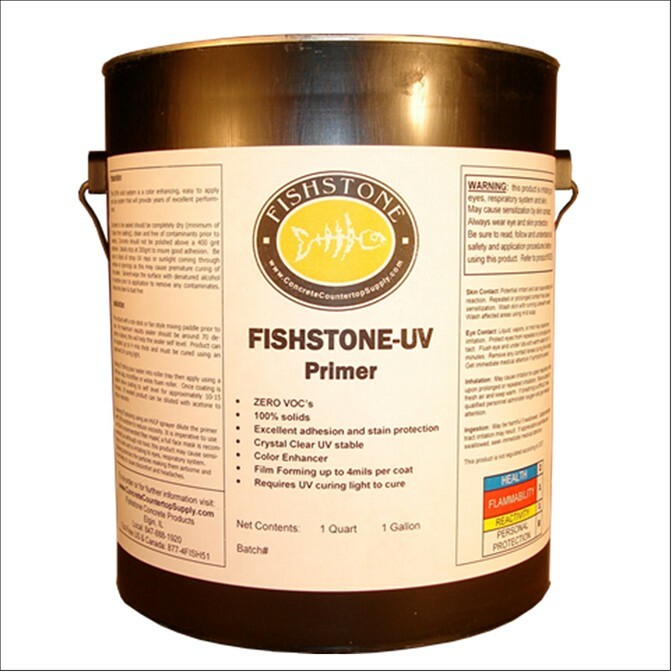 FISHSTONES 100% solid UV-INSTA-CURE Primer can be applied as a thin or thick build system and provides color enhancement (wet look). This product has incredible adhesion and can be used to fill pin holes.